Windows 32 & 64 Bit and OpenVMS. 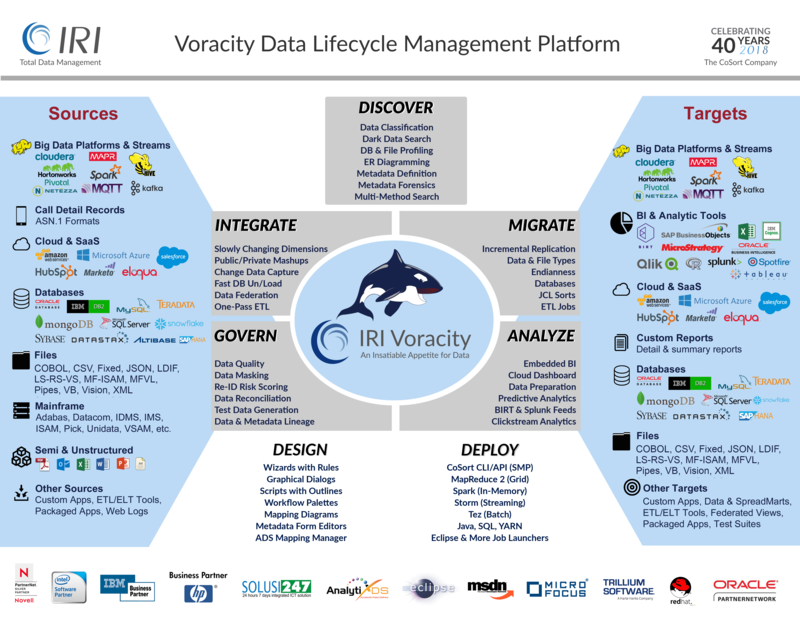 Voracity is the only high-performance, all-in-one data management platform. Control your data in every stage of the lifecycle, and extract maximum value from it. FieldShield locates, categorizes, de-identifies, risk-scores, and audits PII in databases and files. DarkShield discovers, delivers, and deletes PII in unstructured file formats. Chakra Max monitors, blocks, dynamically masks, and audits users/activity in high traffic databases. CellShield finds, reports on, masks, and audits changes to PII in Excel sheets. RowGen generates structurally and referentially correct test data in tables, files, and reports. Renowned software products in the IRI Data Protector suite or IRI Voracity data management platform will: find, classify, and protect personally identifiable information (PII) and other "data at risk" in multiple sources. Each one will help you comply (and prove compliance) with the CCPA, CIPSEA, FERPA, HIPAA/HITECH, PCI DSS, and SOC2 in the US, and international data privacy laws like the GDPR, KVKK, LOPD, PDPA and POPI. Learn more about the IRI Data Protector suite here.